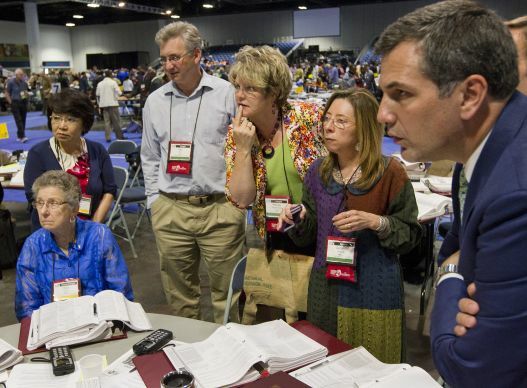 Some United Methodist leaders still talk with frustration about the last day of the 2012 General Conference. That was the afternoon the Judicial Council — the denomination’s top court — struck down as unconstitutional a plan to restructure the denomination’s general agencies. The plan had been years in the making. Delegates then scrambled to downsize agency boards in hopes of salvaging some part of the movement for structural change. What if General Conference delegates could get a heads up that legislation might be in trouble without waiting for a Judicial Council ruling? That is one aim of the Advance Legislative Research Panel proposed by the Commission on General Conference, which met at Lake Junaluska last week. The planned panel will include experts on United Methodist church law who are willing to volunteer significant time reading petitions submitted to the next General Conference in May 2016. The panel members’ task will be to review all petitions they are assigned. They will identify closely related Judicial Council decisions and memoranda as well as related paragraphs in the Book of Discipline, the denomination’s law book. The Discipline includes the denomination’s constitution. The information assembled by panel members would be strictly advisory, and panel members are not to include any editorial comments. Only the Judicial Council officially can answer the question of whether legislation passed by General Conference passes constitutional muster. It will be up to the General Conference whether to take the panel’s advice when it votes on the rules and orders of the meeting. “The commission wanted this to operate as a test model this time around,” said the Rev. Gary Graves, who compiles petitions for General Conference. The panel will operate as though it has already been approved, he said. If General Conference approves the effort, then legislative committees will receive the information compiled. If not, then they won’t. Who can serve on the panel? The commission’s executive committee will select the panel from former Judicial Council members, conference chancellors and members of the Committee on Correlation and Editorial Revision, whichworks to maintain accuracy and consistent language in the Book of Discipline. Being a panel member does not prevent a person from also being General Conference delegate. The goal, for now, is to have 12 panel members — one for each of the 12 legislative committees at the 2016 General Conference. The panel members each will review one legislative committee’s petitions. They will not meet face-to-face but instead review the assigned petitions on their own. In a survey of General Conference delegates, the Commission on General Conference received a number of requests for Judicial Council to review petitions before they go before the delegates. But that’s not possible. Under the Book of Discipline, the Judicial Council only rules on proposed legislation if such a decision is requested by the General Conference as a whole or by the Council of Bishops. As a practical matter, the Judicial Council — which typically meets twice a year — does not have time to review all the submitted legislation. The panel can also avoid another problem, helping to ensure the Book of Discipline does not contain contradictory paragraphs. The 2012 General Conference also faced an issue with disciplinary consistency. It deleted required security of appointment for elders in good standing in one paragraph while leaving it intact in another. The Rev. L. Fitzgerald "Gere" Reist II, General Conference secretary, pointed out the conflicting language a month after the 2012 General Conference had adjourned. Later that year, the issue proved moot when the Judicial Council ruled that eliminating security of appointment would violate the denomination’s constitution. Reist, like others at the commission meeting, sees the advisory panel as a step toward a less frustrating General Conference.